Today we headed back to Sheffield to have a detailed walk through and check on anything that still needed doing. The AGM batteries were due to arrive today so would be fitted on Thursday and all being well we would then get the keys on Friday. 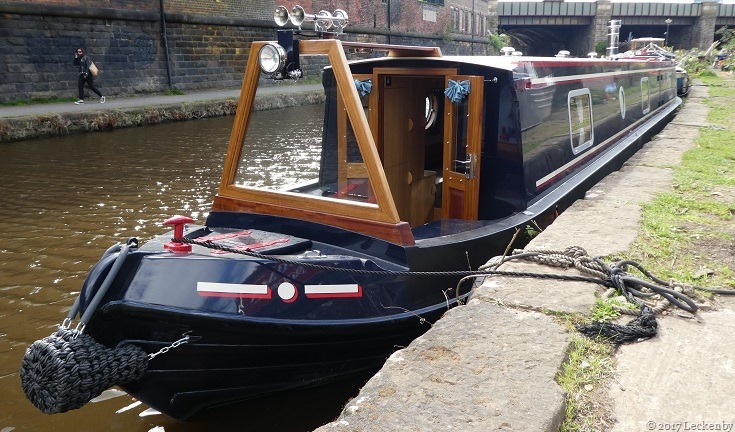 We have decided to cruise her away from Sheffield, my ankle is improving and standing at the helm in locks will be achievable, so we’ll be saving on transportation and craning. Just hope that the weather stays good for our trip on the rivers Trent and Soar. The hooks on the back doors have been adjusted so locker lids don’t interfere with them anymore. The bolts holding the back doors closed are still to be extended or a catch added so that we can cruise with the back doors closed. 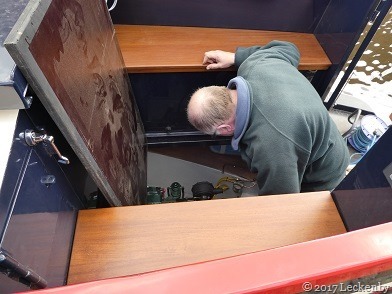 The radio aerial needs an adaptor so that it can be plugged into the socket on the stern. A TV aerial will be ordered in for us. The plank and pole rack position was discussed and decided on. The black band on the stern still needs painting black to separate the cream and red bands. Ricky talked Mick and myself through everything in the electrics cupboard. Alde boiler control, inverter, battery monitor. A lot of information to take in, I think we got more than the basics and will soon understand it all after going through the reading matter. I walked through the whole of the interior checking that cupboards and drawers opened correctly. Only a couple were sticking a little, just small tweaks to hinges. 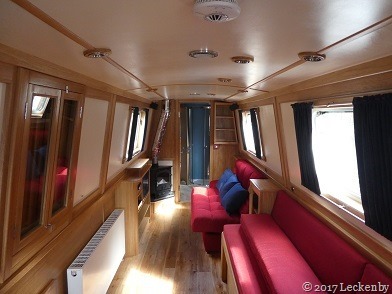 The cabin floor had been given a coat of oil. It had been covered in cardboard for protection for so long that it had gone dull and one or two marks showed up. But as I’d hoped when I chose the flooring a coat of oil brought it back to life and any small marks disappeared. 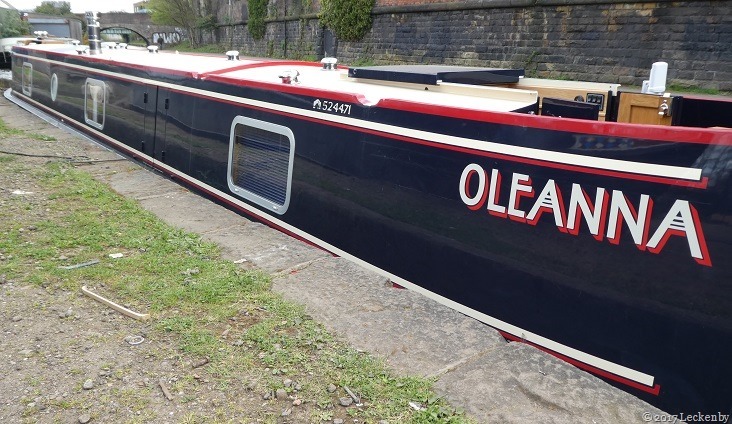 As we will be cruising NB Oleanna to Crick the first two servicing jobs will need doing. At 25 hours of running in gear the gear box oil will need changing and at 50 hours the engine oil and filter will need changing. Mick had a good look round in the engine bay. He currently services Lillyanne which has a Barrus Shire, Oleanna has a Beta 43 so things are in different places. He asked Ricky if he could get in the correct oil and filters for the services, this will not only save time on our cruise south but having actual filters means we’ll have good references for the future. We have ended up ordering poles through Paul at CV Marine in Sheffield, this saves us worrying how to get them from Crick to Sheffield in a car. Prices of planks were extortionate so we plan on buying a scaff plank which I will paint and antislip at some point. We’ll also need a hook up cable so we asked Ricky if they could order one in for us. The diesel tank will have enough in it for us to get to Thorne where we will fill her up. She has a fuel gauge which will need to be recalibrated when we do this as the tank hasn’t as yet been filled. Then we’ll need two gas bottles, we may end up having to pay the deposit on two unless we see a some lying around! All the jobs would be done for Friday when we can pick her up and sail her away! With this in mind we stopped at some services on our way back to Crick so that we could make arrangements. NB Lillyanne would need to be put into the marina whilst we are away, Noel said he’d find room for us. A one way car hire was sorted to be picked up on Thursday swapping it for the van we currently had. This would give us a day to pack essentials for a two week cruise. Insurance and Licence needed paying for and then it would be the final stage payment to Finesse. This entry was posted in Uncategorized on 8th Apr 2017 by pipandmick.